The consultation on the Central London Cycling Grid ends today, Friday 13 February. As they did for the (related) Westminster Cycling Strategy consultation, I hope that thousands of Londoners interested in cycling will respond to TfL. It is worth copying your local council, if it is one of those that covers part of Zone 1, the Royal Parks, and the Canal and River Trust with comments relevant to them as well. The Grid is one of the four main planks of the strategy announced in the Mayor's Vision for cycling in London last year. The others are the Cycle Superhighways and Quietways outside Zone 1, and the Ourter London mini-Hollands. The Grid consists of routes classified both as Superhighways and Quietways, within Zone 1. Within Zone 1, these routes are supposed to form a fairly dense network that will facilitate most cycling journeys in comfort and safety. However, as officials have been keen to tell me, Transport for London cannot impose a plan for the Grid on the boroughs that cover Zone 1, and the other relevant authorities: that is, Camden, Westminster, Islington, The City, Kensington and Chelsea, Lambeth, Southwark, Hackney, the Royal Parks, and the Canal and River Trust. They can only make suggestions and try to ensure coordination, but they cannot force compliance or any particularly standards on local authority roads. Though TfL provides funding, they cannot force consistency (except by withholding funds, which would be a blunt instrument to use). This is a pretty unsatisfactory situation all round, but until the Government or Parliament alters it, there is nothing we can do, and we have to try to get the best result through lobbying. Here are the views on the Grid of London Cycling Campaign and Hammersmith and Fulham Cyclists, and here are those of bloggers As Easy as Riding a Bike, Rachel Aldred, and Sticks and Wheels. The fact that the Grid looks inconsistent between boroughs is due to the fact it is effectively 10 separate projects, of 8 councils plus the Parks and the Canals. My response follows. It concentrates on the north and west of the Grid zone, as the area I know best. The Grid routes need to be as direct as possible, full stop. Otherwise they will not achieve their potential, and the potential for cycling in the Grid area will not be realised. All cyclists require and deserve direct and prioritised routes, whether they are fast, fit and experienced cyclists, used to handling motor traffic, or those who wish to cycle slowly or who refuse to share space with motor traffic. Frequently, this directness and priority cannot be achieved on minor roads. The Grid is too heavily biased away from main roads. Main roads that I suggest should have been included in the Grid are Euston Road, Marylebone Road, Edgware Road, Park Lane, Piccadilly, The Strand, Fleet Street, Whitehall, and Kensington High Street, amongst others. More notice should be taken of the Copenhagen experience of creating a cycle grid: their early attempts to accommodate cycling on back-streets met with limited success. They realised they had instead to carve out safe space for cycling on the main roads that cyclists showed consistently they wished to use. They have now covered nearly all the main (non-motorway) roads in the city. They did succeed in creating the "new type of cyclist" that the Quietway consultation document speaks of, but they did not, primarily, do it by attempting to shove cycling away on small roads. The standards that the Grid is built to, as well as its directness and convenience, will determine its success. The standards that should be adopted are those agreed as policy by London Cycling Campaign. Cyclists should not, on any links on the Grid, have to share space with traffic faster than 20mph or with more than 2,000 Passenger Car Units a day. This means that on streets where either of these limits is exceeded, cyclists must have dedicated, physically protected space. On streets where there is insufficient width to create that space, either that space needs to be created by removing lanes of traffic, which may involve the creation of new one-way streets for motor vehicles, or the speed must be lower than 20mph and the flow must be reduced below 2000 PCU per day by traffic-management measures such as mode-filters (closures allowing bikes through), opposing one-way sections for motors, with cycle exception, and no-entry plugs for motors. The E–W route across Fitzrovia and Marylebone (the Seven Stations Link) that continues Camden's route westward must be more direct than Westminster currently propose. The dotted lines on the TfL map are better than Westminster's actual proposals, which are represented by the solid lines. The route needs to create a direct link to Paddington Station. Conditions in New Cavendish Street are very poor. This street needs either segregated space for cycling, with parking outside cycle tracks, or complete removal of through motor traffic. The signalling of the junctions needs altering, as there are currently too many delays for this to work as an efficient cycle route. Similar remarks apply to the proposed N–S route via Wimpole Street and New Bond Street (or via Harley Street and Hanover Square). New Bond Street in particular would need radical alteration to make it an acceptable route, either segregation or closure to through-traffic. If just these two main E–W and N–S routes are got right, this would be a major useful contribution to the Grid and to cycling in the West End. Westminster's proposals for the route N–S through St James are an indirect mess, and little different to what cyclists are allowed to do at the moment. The best solution is two-way cycling on Marlborough Road, St James's Street and Albermarle Street, or via Queens Walk and Berkeley Street. Hyde Park Corner should not be left as it is. The current crossing arrangements for cyclists, pedestrians and horses are a confused mess. Cycle space should be clearly defined, segregated and spacious enough, and signals must afford sufficient priority and allow for the large flow of cyclists anticipated on the Crossrail route without congestion. Movements of and on to the Crossrail route from other major roads need to be allowed for here, in particular between it and Piccadilly and Grosvenor Place. Significant redesign of the whole junction is required. Currently, there is no safe connection between the Hyde Park paths and Piccadilly or Grosvenor Place. The current routes N and S through Covent Garden and connecting with Waterloo Bridge are poor because they are overloaded with motor traffic. Bow Street is particularly poor. More filtering and/or one-ways for motors are needed. Proper cycle tracks are needed on Waterloo Bridge, with signals to manage the conflict at the north end. The routes from the Hyde Park Corner area north-west towards Camden and Brent are too indirect. This is a consequence of the A5 not being dealt with; it forms the only direct route in this direction. In particular, the junction of the A5 and the A501 actually needs tackling. The loop via Old Marylebone Road and Cosway Street is silly, and the route via Norfolk Cresent, W of the A5, needs to connect with Hyde Park. There is a large unsolved gap around Paddington with no crossing of the A40/A501 and canal between Cosway Street and Westbourne Bridge. The canal towpath and connecting paths could, with work, solve this gap. Westminster's version of the Grid map shows the daftness of the route from Hyde Park (Stanhope Place Gate) towards the NW (in purple). This "avoids the difficult places" (exactly what Andrew Gilligan promised the Quietways would not do), looping round the Edgware Road / Marylebone road junction. A route is shown via Hamilton Terrace (an existing LCN route), but this is a highly unsatisfactory street for cycling, with significant through-traffic and no space for cycling, because of the parking down both sides and down the centre of this very wide road as well. Either the parking need rearranging, to make space for cycle tracks, or the road needs closing off as a motor through-route. It is not needed as a through-route for cars, as it exactly parallels Maida Vale, which has plenty of space and is under capacity. The fiddly southern extension of the Hamilton Terrace route is again unsatisfactory, Edgware Road should be tackled instead. The route via Carlton Vale (the proposed Bradley Wiggins Way, going into Brent) is welcomed, but this will need segregation. The connection between Little Venice and Maida Vale is much needed. This requires alteration of the one-way system in Blomfield Road and Maida Avenue. Hamilton Terrace is a massive boulevard devoted to too much parking and through traffic, on which, on a bike, you get passed far too closely, as this cyclist is finding. It's no good as a Quietway as it is. A route is obviously needed E–W through Kensington. This should be via Kensington High Street, which needs segregated cycle tracks. Holland Walk should be included in the network, properly connected with the roads. 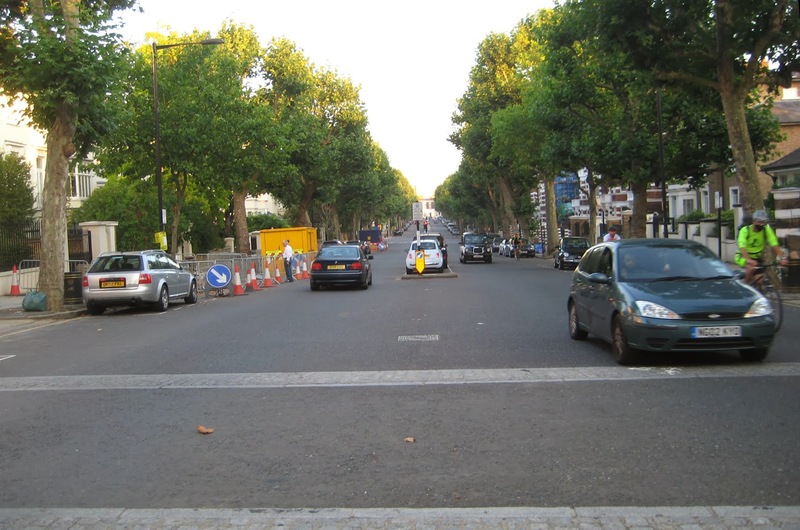 Alternatively, Campden Hill Road could be used, with filtering. But there really must a a route connecting Notting Hill Gate with Kensington High Street. There should also be an E-W cycle path through Holland Park. Ladbroke Grove is an example of a semi-main road that is the only satisfactorily direct connection between many places, and it should be part of the Grid. Semi-segregation in the manner of Camden's Royal College street might be appropriate here, with parking outside the cycle tracks. The current arrangement of advisory cycle lanes outside the parking is no good. Kensington and Chelsea's current proposals for the Grid are particularly bad, the worst of any of the relevant boroughs. The Royal Borough must try far harder to find appropriate routes for cyclists and to create connections. The grid of cycle routes in Camden is already better than in adjacent boroughs, and Camden should be congratulated on proposing some more useful steps here. I would particularly support the connection from Royal College Street to Gloucester Avenue, via Delancey Street, if done to the same standard as Royal College Street, and the proposed extension of the Royal College Street route southwards via Midland Road. I'd also particularly support development of a Clerkenwell Boulevard via Theobalds Road and Bloomsbury Way, one of the most cycled routes in London, with a good standard of two-way, dedicated provision for cyclists, separated from the buses. Where Camden's proposals particularly fall short are in the treatment of the N-S route on Tottenham Court Road or Gower Street. One of these should be prioritised for cycling, with good-quality, ample dedicated space not shared with buses. Taking the totality of width available on these two roads, this must be possible. The concept of making them both two-way should not be elevated in importance over providing dedicated space for cycling on one of them. The highest priority in Camden must be the improvement of the Bloomsbury E-W route, or Seven Stations Link. This is now massively over-capacity, and a whole lane of the road needs to be reallocated, with a consequent readjustment of the one-way system. Though-traffic on this axis needs to be forced back to Euston Road, where it belongs. Alternatively, a series of mode-filters or opposing one-ways for motors would exclude through-traffic and allow a continuous cycling boulevard using the whole width of the road. The network in south Islington is, like that in Camden, already relatively good. However, St John Street needs sorting out. The current cycle lanes do not work, and it needs turning into a cycling boulevard. It does not need through-traffic as it is an exactly parallel alternative to the A1 Goswell Road. The Seven Stations Link route needs clarifying in Islington and bringing up to the same capacity and standard throughout. Priority needs improving and unnecessary stops at traffic signals eliminated. The northward connection from Southwark Bridge needs improving through to Gresham Street. There is a chain of unsatisfactory shared-space type crossings which engender confusion a with pedestrian flows. The cycle route here should be clearly defined and properly signalised and separated from pedestrians. Cycling should be permitted through Smithfield Market. There needs to be a two-way route between St Pauls, Smithfield and Farringdon via Aldersgate Street, which is very wide, also connecting with Gresham Street. This would achieve a direct connection between Bank and the St Pauls area and the Seven Stations Link route in Islington. The Superhighway across London Bridge needs connecting northwards. Both Blackfriars and London Bridges need segregated cycle tracks. A route needs to be taken through Bank junction, which needs simplifying and some roads closing off. Cycle tracks are needed on Blackfriars Bridge, with signals to manage the conflicts at the north end. The routes through the parks need to be open 24 hours a day for the whole year. 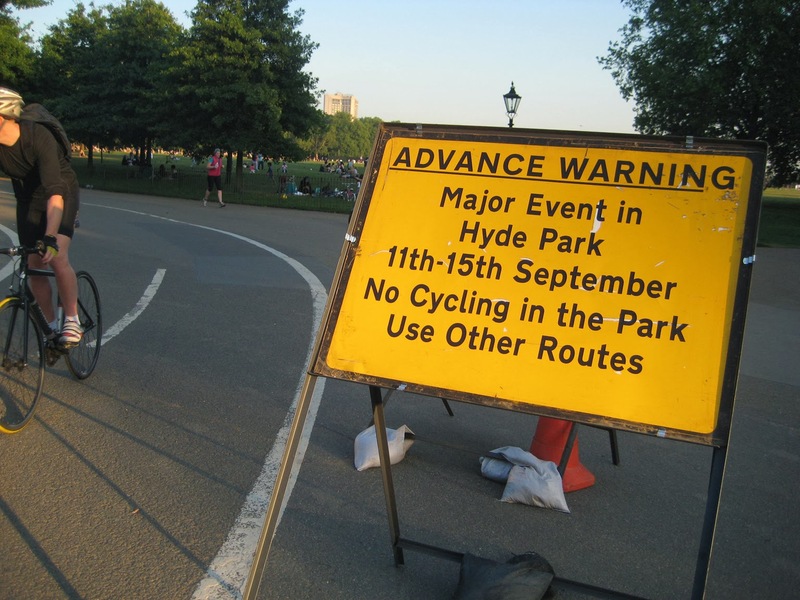 They cannot be allowed to be disrupted by arbitrary events such as entertainments in Hyde Park, which regularly cause the closing of the southern end of the Broad Walk. The cycle and pedestrian and horse paths along Rotten Row need to be redesigned, with enough capacity for all traffic. Currently far too little space is allocated to both cycling and walking. The conflicts around the Rotten Row - Broad Walk - South Carriage Drive junction need sorting out rationally. Some of the gates into the parks probably need widening. The current infrastructure in Hyde Park and Green Park will not be able to cope with the flows that the East-West "Crossrail" route will generate. The cycle path along the south side of Green Park needs massively widening. Cycling N–S via Queens Walk needs to be permitted. There needs to be a route diagonally across Hyde Park from the Serpentine Bridge to Albion Street. The routes through the parks can be no good as elements of a serious cycle grid if the Royal Park Agency can constantly close them for their own commercial / sporting enterprises, as happens at the moment. When this route is closed cyclists must use the motorway of Park Lane, or give up. In Regents Park, the route N–S needs to continue all the way down the Broadwalk. Most critically, through-traffic needs to be removed from the Outer Circle. This would be a huge benefit to the park as a whole, not just cycling. It would also be consistent with the original purposes of the roads through the park which were laid down in the 1820s for exercise and recreation, not as general traffic routes. Such a step would be an act of restoration for the park routes back to their proper purpose. The Charlbert Street and St Marks Square bridges across the canal should be made cycleable, and should be widened if this is not possible with the existing structures. That's enough. I'll leave other people to deal with Hackney, Southwark and Lambeth. The main point is to get your responses in today, welcoming the principle of the Grid, but pointing out some of the flaws and gaps in the current proposals. What should we learn from the Advertising Standards debacle? I didn't cover Scottish Cycling's regressive, victim-blaming Niceway Code advertising campaign of last year at the time, partially because this is a London-focused blog and partially because many other bloggers gave it a good thrashing anyway (in fact it actually spawned new blogs and Twitter feeds that came into existence just to attack it), but mainly because it was the type of thing we get from time to time that goes away quickly, leaving the world no different for it ever having existed, so it didn't seem particularly worth while. Four months after this dismal campaign ended, the affair came back in a new form. The wheels of the Advertising Standards Authority had turned slowly, and they had assessed the hundreds of complaints the Nice Way Code's dreadful adverts had generated. And they had decided to uphold one complaint (made by five separate people, apparently), with the effect that the absurd and dehumanising "Think Horse" commercial could not be broadcast again, despite the fact that Scottish Cycling had no intention of broadcasting it again, as the money for the campaign had run out long ago. We considered that the scene featuring the cyclist on a road without wearing a helmet undermined the recommendations set out in the Highway Code. Furthermore, we were concerned that whilst the cyclist was more than 0.5 metres from the kerb, they appeared to be located more in the centre of the lane when the car behind overtook them and the car almost had to enter the right lane of traffic. Therefore, for those reasons we concluded the ad was socially irresponsible and likely to condone or encourage behaviour prejudicial to health and safety. This set a terrible precedent, so suddenly cyclists were at the barricades again, this time defending Cycling Scotland's advert, with a massive campaign of emails, blogs and Tweets directed to getting the ASA to change their minds, that extended to MPs and attracted sympathetic comment even in the right-wing press. The ASA has withdrawn its formal ruling against a Cycling Scotland ad pending the outcome of an Independent Review. That followed a request from Cycling Scotland, in which it argued that the ASA’s criticism of the positioning of the cyclist was incorrect. The decision to withdraw was made by the ASA Chief Executive in light of a potential flaw in our ruling. Once the Independent Review process is complete we will publish our decision on our website. It would be wrong to start celebrating prematurely. It is noteworthy that the ASA’s announcement only references a "potential flaw" in their ruling on the cyclist’s road positioning, without mentioning their non-use of a helmet or other ‘protective equipment’. .....what if the ASA is looking to ‘save face’ by backing down on road-positioning, while sticking to their guns on helmets, citing the Highway Code Rule 59 in their defence? If we end up with the ASA imposing de facto censorship of helmet-free cycling on TV, that would be an appalling blow to the promotion of cycling as a safe, enjoyable, aspirational and (above all) perfectly normal way for people of all ages and backgrounds to get around for day-to-day journeys or for leisure. Well it certainly would not be good. But I'd like to take a step back from all this agitation about one stupid and insulting advert. 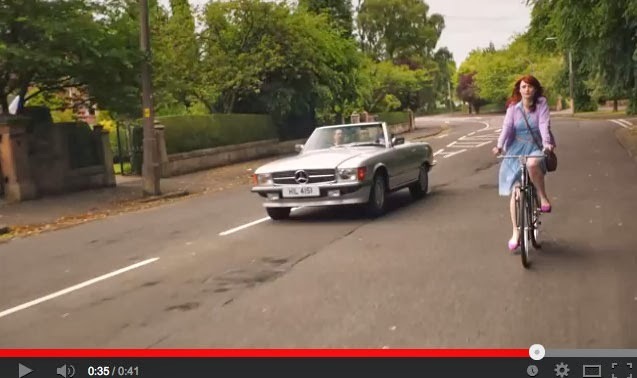 For the initial crime was Cycling Scotland's anti-cycling Nice Way Code campaign. Just because they had one of their adverts struck down by people with even less idea of how to build a safe cycling culture than them did not make them into Good Guys worth in any way supporting or defending, and I'm not going to start doing that. Furthermore, the whole furore around this just shows how far we are away from concentrating on what is important in building a safe cycling culture. That's physically building an environment where cycling works for anyone who wants to do it. Adverts and PR and image-making aren't actually all that important. They are a side-show. Cycling in the Netherlands and Denmark does not work because everybody has the right attitudes, and cycling has the right image, it works because they have built the correct physical environment. The image is better there as well, yes, and attitudes are slightly different, but this follows from the engineering of the physical environment and the consequent democratisation of cycling. Britain at this particular historical period, however, has lost sight of her past engineering prowess, and since the 1980s has become obsessed with spin, advertising and image, thinking these more important, and this extends into the cycling world and is manifested in the attention given to this whole controversy. The energy directed into this would probably be better spent elsewhere: in campaigning for tangible change (as indeed LCC is doing with its Space for Cycling campaign). Though I'm totally against the use of helmets for normal cycling, I've never discussed the subject here. Why? Because the whole subject generates more heat that it's worth. People can wear whatever they like. What I'm campaigning for is an environment so safe and so conducive to cycling that the suggestion that cyclists should normally wear helmets in that environment would be dismissed as absurd by any average person, as it is in the Netherlands. Just as the suggestion that people walking should normally wear helmets would be dimissed as absurd by any average British person now. I consider that we will get to that point through campaigning for infrastructure change, not by talking about helmets. So infrastructure change remains resolutely my focus. We'll get the right attitudes when we have enough people cycling, that it's no longer in any way a niche activity, and we'll get that when conditions are subjectively safe enough, guaranteed by concrete infrastructure, not by hopes of good behaviour. Then the attitudes that ASA demonstrated in their ruling against Think Horse, as well as the attitudes enshrined in the Niceway Code campaign itself, will be as generally unacceptable as racism and homophobia. In the present environment though, the conclusions that ASA came to first, before they rowed back, are perfectly understandable. They are, in a sense, correct; ASA is, or was, merely reflecting common understanding of how the roads should work with respect to bikes and motor vehicles. Their ruling showed up various pieces of hypocrisy not of their making, and therefore it is wrong to blame them wholly for it. I wrote before of The problem with assertive cycling. My argument in that post was essentially that cycle training in the Bikeability sense embodies a lie, which puts cyclists "between a rock and a hard place". The lie exists in the fact that the government would never impose a statutory duty on motorists to overtake cyclists in the manner recommended by the Highway Code, and enforce that. Motorists would regard it as intolerable that they were held up by cyclists all the time, and always had to dawdle behind them, if they had to allocate them a whole lane, and change lane to overtake them. The ASA were just interpreting practice on the road as they found it. We can shout and shout about how cyclists should be taking the primary position and motorists should have to change lane to overtake, but in the real world, most of the time, this does not and cannot happen. The road situation shown at 0:35 of Think Horse strikes me as hugely untypical: the width of the road, the lack of oncoming vehicles. the space available. The cyclist actually seems to have no reason to be riding so far from the kerb. It's not a realistic scenario, and has nothing to do with the problems I encounter every time I get on a bike in London, which are about how you get through without intimidation on multi-lane roads full of moving vehicles, or on parked-up residential streets that are effectively only one lane wide, and where nobody can overtake or pass anybody without squeezing through, and I'm not clear what anybody was ever supposed to learn from it. If they'd shown a realistic situation of conflict, where a motorist is forced to wait for a whole minute or two while a cyclist gets to the end of a road where safe overtaking is impossible, and told us what we are supposed to do there, that would have been different. But this is no help at all. Someone in the ASA thought that this cyclist was in a funny position in the road (which, actually, they are) and thought it showed somebody doing something "socially irresponsible" (not that any car advert approved by ASA ever showed anyone doing anything socially irresponsible, of course). But this is just how most members of the public would probably regard it. With the helmets issue, the problem lies more clearly with the Highway Code itself. This says cyclists should wear helmets. You and I know there is important distinction in the Code between places where it says should and places where it says must, but this will be lost on most people, and clearly was on the ASA adjudicators. There's a "common-sense" argument which could have run, in their minds: "The Highway Code says cyclists should wear helmets, therefore there must be some good reason for it to say that, therefore it must be unsafe and socially irresponsible of cyclists if they don't heed that advice, therefore we should ban this advert for that reason". There's a parallel here with the "not guilty" verdicts that juries often come up with in road death cases, that campaigners find deeply unacceptable. The actual purpose of juries is to take a "common-sense" view of the case, whatever that means, and in a car-oriented society, where the cyclist is regarded as a distinctly peculiar creature by most, and majority sympathy lies with the motorist, the result will be these miscarriages of justice that we see. What's the real problem here? The problem is that the Highway Code mentions helmets at all, and uses this word should. The Highway Code should be clearer. It should be a set of rules that everyone must obey at all times on the public roads, punishable by law if they do not. It has no business getting into dubious behavioural recommendations, like helmets for cyclists, high-vis clothing for walkers or luminous leads for dogs. If Parliament wants those things to be law (which it does not), it should make them the law. The Department for Transport should throw all the shoulds out of the Highway Code. Every one of the shoulds is just a way of transferring a little bit of blame on to those not responsible for road danger, but who suffer disproportionally from it. The shoulds, in their quasi-legal, quasi-rescriptive character, just confuse the public, and ASA is merely reflecting that confusion. A great number of people, including me, would dispute that cyclists should wear helmets. There is a great raft of data and argument against it, so familiar, I am sure, to readers of this blog, that I will not go into it. I don't think it is particularly surprising that ASA are confused about this subject, which is not their speciality, when the DfT is so confused. It's correct to point out, as CTC do in the link above, that ASA never try to enforce in advertising any of the other Highway Code shoulds, such as high-vis for pedestrains at night, and therefore they are clearly singling out cyclists for dicriminatory treatment. But clearly, also, there is no reason for all shoulds to be considered equal. It would probably appear as "common-sense" to the ASA adjudicators that clothing for pedestrains is just a matter of personal choice, but that there are serious safety issues invoved in the attire of anyone getting on a bicycle. This is the sort of discrimination we have to combat, and, in the end, I suspect it will persist until we can normalise everyday utility cycling into British society. This can't happen until we get a massive re-engineering of our roads and streets such that it ceases to be the case that the only pleasant and practical way to use them is in a motor vehicle. I can't get too het up about the banning (or not) of one silly advert based on an argument between two sets of people, both of whom have regressive attitudes. Let's put the effort into getting real change of the streets. So often I hear people say, "We need to change the attitudes now, as it will take too long to get decent infrastructure in". Well, it only seems to take a long time to get decent infrastructure in because we never really start. Getting that start should be the focus of our efforts.